Read my personal Mary Kay reviews on products like Mary Kay blush, illuminator, rosy lipstick and their amazing concealer! Mary Kay and Avon are two of the largest member distributing makeup giants in the world. Thousands of women tout their products at home parties and through networking. Mary Kay isn’t sold in physical stores, although you can buy their products online. Usually, you buy through a Mary Kay representative- the lady who brings the Mary Kay party to your house to sell products to you and your friends. For this very reason, I avoided getting into the world of “network makeup-ing” and selected other brands of makeup for my personal use. To this day I still haven’t purchased any makeup through Avon, although their catalog products look strikingly similar to some Mary Kay products. Fast forward to the summer of last year, and I was suddenly invited over for a Mary Kay party by my best friend who was looking for her wedding makeup. As one of the bridesmaids, I could hardly not show up. I needed bridesmaid makeup anyway, I rationalized. I learned a few things from that Mary Kay party that both surprised me and confirmed some of my suspicions. Yes, it really is a makeup-pushing “party” where they give you samples to try and then take orders at the end. They will even lure you into giving up friends names and phone numbers, as well as attending “seminars” where they pass out free products and then convince you to start your own Mary Kay “business”. I had a preconceived notion that their makeup was less than stellar. They certainly are no Smashbox, but Mary Kay has carved out a niche for themselves with high quality products that are reasonably priced. If you don’t mind the sales trap, as some would call it, attending one of these parties can actually be a fun thing to do with your friends. Let me start with two Mary Kay reviews of my favorite products. The concealer in Ivory 2 for my fair skin is no doubt the best concealer I have ever owned. It is very thick, creamy, and would cover a marble. At $10 a tube, I have been very happy with this product. My next favorite product is the liquid illuminator for your face. This stuff makes you look beautiful! It is a pearly liquid that you can put on the high points of your face to give you a dewy look. It doesn’t look glittery and it definitely isn’t sticky. I especially love wearing this product during summer as it gives off that beach babe flair. The illuminator is $20 for a decent sized tube and will last me for years. Another product I really liked is the blush. 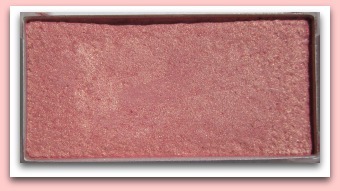 I bought the “Shy Blush” compact, which is actually a pressed mineral color. The pros are that this product looked better than any other blush I have tried, likely because it contained tiny flecks of gold in its rosy powder. I would even use this as a highlighter on my face. The cons were mainly in the packaging for this one. If you look up any Mary Kay reviews, you'll see that their packaging isn’t all that pretty, which is likely how they keep their prices low. This blush tin came in a cheap plastic snap-together case, functional yet chintzy. One product they didn’t skimp so much on is their lipstick. 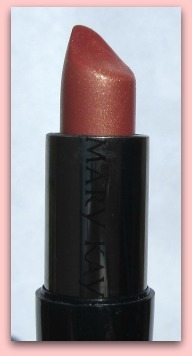 Mary Kay’s lipstick is great, and the tube itself is good quality. The lipstick has a lot of vibrant color and goes on smoothly. I bought the shade Sweet Nectar, which is almost the same color as the Shy Blush I also bought. Seem like too much? These two together make my face look bright, lively, and natural. I am impressed. One of the products my friend and I both bought for her wedding was the creme eyeshadow. I don’t wear creme eyeshadow often, but this product was really nice. I bought it in Glacier Gray, and I like its texture. 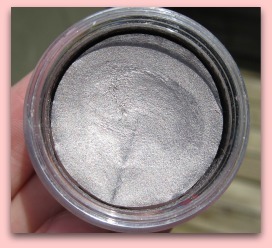 Some creme eyeshadows are too goopy to really use, but this kind is hard in the package and glides on nicely. The color is very dense, so I only need a swipe or two to get the look I want. Overall, I am impressed with Mary Kay’s products. I am definitely more likely to purchase online so I don’t have to go through the process again, but I would buy more of their products. The catalog is also a great way to get products without hassle, although the sales party is really the only way to sample any makeup before you buy. Return to Makeup Tips Home from "Mary Kay Reviews"